My husband and I rescued a black and silver coloured guinea pig. Our next-door-neighbour was pet-sitting him last December holidays while his family, friends of hers went on vacation. He’d been left in her care in a rather poor state of health, housed in a divided cage with a giant white rabbit. His cries both day and night unnerved my neighbour, who didn’t know what to do. Our decision to adopt him was instant. 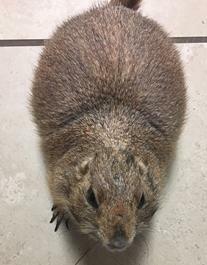 During an urgent visit, our veterinarian injected him with medication to kill burrowing mites for he’d scratched himself raw, leaving a gaping and weeping wound across his back, from shoulder blade to shoulder blade. 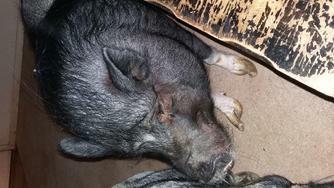 Our youngest son named him Pumbaa after the warthog character in Disney’s 1994 children’s animated film, The Lion King. In addition other affectionate names were given to him over time such as, Pumee, Pumbee and Pumpum. Pumee settled comfortably into our family consisting of; Dad, Mum, our 2 adult sons plus our other pets namely 2 dogs, a cat, 6 finches, and a frog. With his health restored and the days turning into weeks, we soon discovered this little furry fellow had a likeable personality all his own. Our family soon developed its own interpretation of his language, both vocal and body – when he was stroked he’d purr with a sound like “prrrrrt, prrrrrt”. Sometimes you’d hear a “chht, chht, chht” call when he became alarmed, by a loud and unexpected noise. He’d hold his head high to signal he wished to be picked up and cuddled, then stamp his front paws in your hand as a sign he wanted to be put down again. When his wee body rested on your forearm, his back legs dangled on either side while his front paws and head nestled in the palm of your hand. Quite often he’d lick your finger, to indicate he was hungry. And he’d look stern, if he felt he’d waited too long for his supper. Among his favourite foods was puha and lemon leaves, broccoli and parsnip, carrot and slices of crunchy pear, but his all-time favourite was apple. Often-times he’d nibble on hay or a bunch of freshly picked grass or a handful of dried store-bought pellets. In the early evenings his father would sit Pumee on his knees, where he’d wait to choose from a medley of vegetables, one at a time. He also knew when the pieces had become old and soft; he’d simply turn his head. His Dad provided him with a small hutch for daytime outdoor living, a large plastic under-bed storage container filled with hay for indoors (his playpen), if the weather turned inclement, as well as an unused cat cage with towel bedding, for night-time use (his bedroom). Amazingly, he quickly became familiar with every noise in the house, from the opening and closing of the sliding door, or refrigerator, to the chopping of his vegetables, to our voices and the different barking tones of our dogs. Cleaning, feeding, cuddling and talking to him on a daily basis was an absolute joy. As a first-time parent of a guinea pig I took delight in his company while my husband was at work. Then about a month ago, events took a turn for the worse. Over a couple of days he’d stopped eating. Food I left for him at night remained untouched. This was followed by back-to-normal eating and as my husband and I had to go away on family business for a few days, we placed him in the care of our son. However, four days into our trip we received an urgent message – he wasn’t eating again and two days later we returned home. He’d lost so much weight. An earlier Vet visit with our son had him on pain relief medication and a critical care food package. We nursed him continuously over the following 6 days and were awaiting further results of the latest group of blood tests and x-rays, taken on the Monday. Sadly, while cradled in the supportive arms of his Dad, our brave little fighter slipped quietly into his long sleep on Tuesday evening 14th November 2017. Although full of sorrow, I had the greatest pleasure to care for him one last time. I delicately sponged and brushed his wonderfully soft fur, then gently wrapped and cushioned him in his own towel and blanket in preparation for a little send off the next day. Special items such as photographs of him and bits of his favourite foods were placed in the little box alongside him, for his journey to Rainbow Bridge. Reverently, he was laid to rest in our backyard beside our dog Amber. Although Pumee was with us for just a few short months I’m heartbroken by his sudden death and have cried every day since, such is my overwhelming grief and an indescribable loneliness. My arms ache to hold his soft and warm little body, to feel his heart beating and my ears yearn to hear his soft purr; Pumee was my ‘midnight buddy’. On brighter notes, Pumee was so handsome, so gorgeous, intelligent, a quick learner, had a strong awareness of his surroundings, a legendary sense of smell, strong-willed, friendly, laid-back and above all he was an affectionate wee guinea pig. The impact Pumee had on this family in these short months runs deep as this narrative may suggest. We miss him, but will always remember the happiness and humour he bought into our lives – thank you Pumee. It’s pleasing for us to know he’s with our other beloved family pets at Rainbow Bridge. We’ll see you there. (Anniversary Date: 21 Nov 2017). I got Tucker when I went to a pet store near me to get cat food and saw him and instantly fell in love. He was two months old at the time that I got him and from the time we brought him home he was never content in a cage which I was fine with because it allowed us to bond a lot more he slept with me or in his bed next to mine every night. 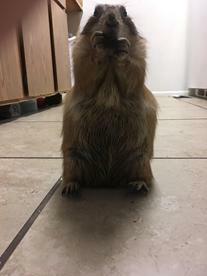 Honestly I never thought I would get so attached but he was the sweetest little guy you could ask for but only to us we found out that prairie dogs really only like their people so having guests over wasn't easy he would literally chase them and that’s really the only time he’d be in a cage. We tried to get him a harness and take him outside as some prairie dog owners do but he wanted no part of it Tucker preferred to lay in my bed and watch tv or cuddle with me. He loved sweet potatoes and for his first birthday we boiled him some potatoes because that was his favorite food. Almonds were also one of his favorites he used to just plop down and eat them whenever he could. At bed time Tucker would make me rub him and sing to him until he fell asleep he was seriously like my child. 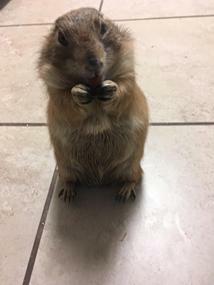 Prairie dogs are known to get a tumor in their nose when they’re older and they can only breathe out of their nose so that really was the worst thing that could happen to them and unfortunately at a year and a half old Tucker got it the vet said it was simply bad luck. Tucker was my sunshine and I miss him everyday but I know that he is in a better place and no longer suffering. Shadow was born 06/26/2003 in Lincoln California he traveled to Bangor Maine on a plane to meet his forever family 08/29/2003. His purpose in my life was to help me to regain strength and to walk again. He became my best friend from the start. After my surgery he came and climbed into bed with me. He smelled my leg where the cast was and very gently lifted my leg and laid down under it so my leg was elevated. He would encourage me to get up and take him for walks. He was such a character he loved having his picture taken. He loved belly rubs, hair brushing and getting big hugs. He would always greet me first thing in the morning for his peanut butter toast, and would not go to bed at night until he had his vitamin. He always knew what I need and was always there with his silly faces he would make to get me to feel better. He was the most loving gentle animal. Shadow would say a few words, mama, bad bad, naughty and yum yum when he really liked something, like a bag of Halloween candy he stole from my daughter. We chased him around laughing so hard because it was so funny to hear him and see him with the bag. He turned 14 this year and then his health started to fail. He just would get up walk across the floor and lay down fall back to sleep and snore really really loud. This was when we found out that his heart was starting to fail. He passed away on 10/08/17 quietly in his sleep. He will always be a special part of me. Shadow was my best friend. The love he showed will never be forgotten. We got Snowflake in an unusual way. One day we went to Weight Watchers for my husband and I looked for something in his trunk and he said, "No, don't go in there, you will ruin the surprise." So, naturally I went in there. I found bedding, hay, a cage, and food. The only thing he waited for me on was to pick out what kind of rabbit I wanted. We hadn't discussed getting a rabbit. I was completely, happily surprised, as I used to play with rabbits at my mother's friends house in the neighborhood when I was a little girl and my husband used to have one for about a day when he was little and his mother wouldn't let him keep it. Even in that one day, the rabbit he had profoundly impacted his life as he would watch TV and pet it. He knew someday he would have a rabbit again. We had to wait 3 months for the kind of rabbit I wanted. We got her when she was 7 weeks old (11/20/09) at the pet store. 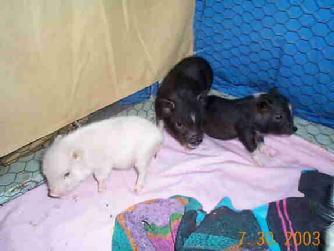 We picked the name Snowflake because she was all white but not albino, she had a little brown on the top of her ears and big bright black eyes with a little black under her eyes (looks like she had black eyeliner on) with a cute rounded face. Her breed was a dwarf hotot. I nicknamed her pretty girl. We would let her roam the house when we were home. She liked to dig out the carpet, hop around, sit in the small model of Yankee Stadium, lay down and watch me on the WII, and sit on a pillow next to my husband and watch Sean Hannity. She loved family and friends, hopping over to them and smelling them, and letting them pet her. She just didn't like them to tickle her on her fur. Then as she got a little older she would jump on the couch and jump down. Then a little while later we took her on a trip to North Carolina with us. Oh, how she loved it. She would sit on a shelf that was elevated in her cage and chill out. We checked on her every two hours. She never got sick. Every time we stopped people looked and said how cute she was and she was just laid back, relaxing and taking it all in. A few months later, sometimes when I would brush Snowflake under her chin where she had an extra layer of fur (it looked like a double chin), she wouldn’t like it and she would put the brush in her mouth and push the brush away. Then she started to know her name as when we called her she would always look and hop toward us, get excited to see us. Then when we took her out and held her she started to give us kisses. Then we would kiss her nose and she would stay there till we were finished. When I got home after work I would sit and pet her for hours and talk to her as she just sat there. She would eat out of my hand and when my husband or I gave her the papaya (just from the shake of the bottle) she would rush over and reach up for it. 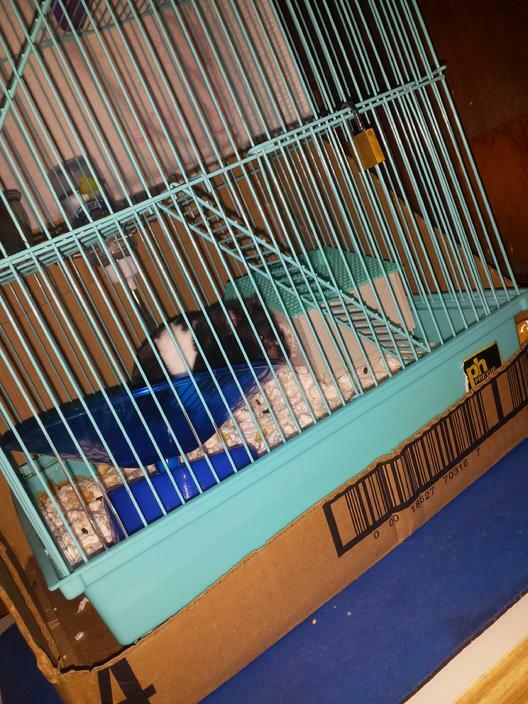 I was even able to get her back in the cage by showing her the treat and then when she got back into the cage I gave it to her. Then all of a sudden she started having health problems. We took her to the vet who treated her. She was having gastrointestinal problems. They gave her injections twice a day for 5 days for pain, antibiotics, and dehydration. During the week she was doing better. The vet mentioned to us she was very lucky because he hadn’t seen a bunny that would hang on that long. We took her home each of the 5 days except for one. On Wednesday night, we gave her pineapple juice in a syringe, and Thursday night and Friday night we gave her in two syringes pineapple juice and mushed pellets, and the green part from the top of a carrot. Thursday night she was kissing us again (for the first time since Sunday). Friday night she was even eating hay by herself. She was not grinding her teeth. When we woke up Saturday morning (8/6/11) to take her to the vet for a set of shots, I found her in her cage passed away. We are happy she died at home and that she was not in any pain when she died. We gave her a burial. We put some of her favorite toys and food next to her. The hardest part is she was so young, she was just a baby. She was only a year and 10 months. We were told bunnies can live to be 5 – 8 years indoors. She had a wonderful short life. We learned a lot about bunnies when bunnies shed to brush them everyday as opposed to once a week, how sociable bunnies can be, that they have very nice and gentle personalities, and how they are so lovable. We love you Snowflake and always will. 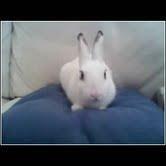 Snowflake is forever in our hearts. May Snowflake rest in peace and we should all be well, let us say, Amen. It was ten o'clock at night, and it was an unusually warm February night as I took one of my two dogs out for his last walk of the night. We strolled through the complex where I lived coming across the occasional wild bunny or two, but there was something different that came out of one of the bushes that night, and this furry little creature had no problem coming right up to me and my 77 pound dog!!! To my amazement this was no bunny, this was a ferret, a big fluffy ferret with no fear of me or my dog. I didn't know what to do, and I was nervous that my dog might try to jump on it if it got too close, so I decided to just keep walking. This ferret was determined though and had no intentions on going away, nope, he wanted SOMETHING and I was his chosen one. I knew I couldn't leave him and there was no one else around so I bent down to pick him up, while praying that my dog wouldn't confuse him with one of his toys. I stood there for a few minutes holding this obvious lost or abandoned ferret wondering if someone would be coming any minute to retrieve him, but no one ever came. Already having two female ferrets of my own at home, I knew I could bring him home and safely house him in one of our extra cages as I waited to see if someone would put the word out about a lost ferret. So that's what I did. We set up an extra cage right next to the cage that housed my girl ferrets so they could get to know each other in a safe manner. This boy was big, much bigger then my females, and his fur was was a combination of beautiful colors. He was friendly, well trained and in good health, but yet no one ever posted anything about this lost little guy. When I finally realized that this boy was now going to be a permanent resident of my home I decided to call him Bernie. I eventually moved him into the big cage with my two females where they all lived together. Never once was there an issue, it was unbelievable, he accepted them and they accepted him. They were funny to watch, especially when they were out of the cage, playing with their toys. Bernie's favorite toy was a tiny stuffed football that he would pick up in his mouth and take off running, just like he was running to make that touchdown. He was great. How could I get so lucky to find this pet outside and it happens to be an amazing, loving pet that never once tried to bite anyone!!!! They got along great, it was as if he was always there, it worked out exactly as I had hoped. Eventually as time went on, both of my females passed on and poor Bernie was alone. I thought about getting him a friend but I never did. He carried on but I'm sure he missed his sisters. It wasn't until recently I knew he too would be going to join his sisters soon. My big boy was now not as big or strong looking, and he had lost all of his fur but he was still as beautiful as the first day he came running up to me. I lost my Bernie on June 24th, the very same day I lost my love Minnie, my miniature poodle. Losing one is horrible, but having to deal with a double loss, on the exact same day was absolutely devastating. My home is not the same, and even though I still have four cats and another dog here, the quiet that has filled my home from that terrible day has been brutal to deal with. I miss my Bernie a lot, but I am very thankful that on that night five years ago God put me where I needed to be to save a life, Bernie's life. I miss you Big Boy, you may be physically gone, but you will live in my heart forever. Until we meet again, I love you Bernie. A couple months before Brendan turned 8 years old he asked can I get a guinea pig. Mostly it was due to our other neighbors having two of them so we kept looking in the Heights Pet Store . So then about a week after Brendan's 8th birthday we ended up at the Heights Pet Store as they told us they ended up with some guinea pigs so as we walked into Brendan said he wanted a rabbit, but I told him we got permission to get a guinea pig. So we walked to the guinea pig area saw one piggy staring at us. We picked him and up said "We would like this one!". We asked where did the pet store get this guinea pig the clerk said he was a drop off because the family was moving . So we brought him home and named him Fuzzy. Fuzzy was always such a hungry pig wheeking for his favorite treats like parsley and so picky at what kind of parsley he got as it had to be the curly kind from a certain farm otherwise he wouldn't eat it! He would gobble up his cucumbers in a matter of minutes. He loved Romaine lettuce. He would be wheeking as soon as you woke up, walked in the door after coming home from the store. He loved snuggling and curling up into a little ball. He also like to chew on Mr. Blackie our almost 12 year old cat fur along with snuggling up with him. He also loved to hide in my 12 yr old son's blanket. He loved licking his fingers while he loved giving me kisses. He was a sweetheart! We don't really know why he died because he did not show symptoms and passed away shortly after a visit to the vet. The vet said he had fluid in his lungs so more likely she assumed it was pneumonia but it may have been the start of CHF which we believed could have been helped. It has been really hard living without him. It seems a little better as we move forward through the weeks; it has been almost a month since his passing. It was just so sudden and so unexpected. For a while I blamed myself thinking I should have known earlier that he was sick. I miss him running around the pillows! But sadly guinea pigs hide illness as a survival mechanism so the prey don't get them . It has been hard for Brendan to los him. We did a balloon release for him and got a Christmas memorial ornament that says Love U Fuzzy. Brendan was thrilled about the ornament as in Happy n Sad at the same time as we both miss that sweet piggy as he had so many nicknames for him like Fuzzy Buns, Fuzzy Nuzzy, Piggy Pig Pig ..
Buttercup came into my life at a time when I was in deep despair. I had been struggling with a loss of a life long friendship. My sister wanted me to go for a drive to a nearby farm; I reluctantly agreed to go with her. We arrived at the farm and there was a little goat kid, about 5 months old. She was so cute and when I seen her it was the first time in what seemed like forever that I felt joy in my heart. For a little goat she had a huge presence, full of joy and love of life. Without even considering what I would have to arrange to keep a goat I bought her on the spot and brought her home the same day. Buttercup was full of life, she was mischievous and often got herself in the way of whatever was going on, but even at these times she made me smile and brought so much joy into my life. She became my companion in everything I did around the farm. She was with me when I did my morning and evening barn chores, she was there when I was splitting and stacking firewood, and often at meal times I would look out my kitchen window and she would be standing there looking in at us. I know she would have loved to come into the house and, without my husbands awareness, I would secretly let her in for a few minutes every once in a while. 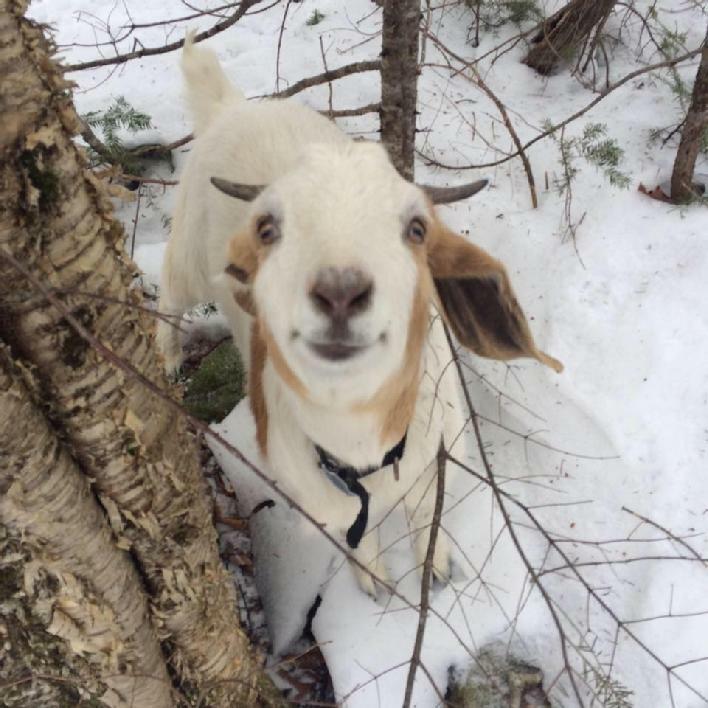 I never knew a goat could be such a loyal friend. Buttercup was very affectionate, she would come to me and I would scratch her head on her favorite place just behind her horns. She would greet me when I come home from work with little bleats and run to my car. She would look into my eyes with such kindness; there was not a mean bone in this little body of hers. She warmed my heart so much; I never thought I could love a little animal like this. She was so full of love, love of life, love of all the other animals on our farm. She was with me for 6 months, but in those short 6 months she has brought me so much joy and love at a time in my life when I felt joy and love was next to impossible. Buttercup will always have a very special place in my heart. Our farm will never be the same without her, for a little goat she had an immense spirit. Christian would seem like any other hamster, he slept a lot, ate quite a bit, and I constantly had to clean his cage; but to me, he was special. Our whole life together started three and a half years ago when I decided I wanted to commit to a pet that would be my very own. I didn't want to start with a cat or a dog, I wanted to start small, so I decided on a hamster. I spent weeks looking up care for hamsters and decided to go and find the right one.. I walked into my favorite pet store and went straight for the hamster area, because I knew that I already wanted a panda bear hamster.. I looked around for a bit and most of them just seemed so lazy, but then I saw him.. He was running around, running on the wheel, so full of energy, he was perfect. One of the people warned me he was a biter, but I didn't care... He was the one. So I brought him home. It took a couple months but we finally broke him of biting. He loved running around in his ball and I had a blast watching him. Christian was such a wild explorer, I just knew he was the perfect little hamster for me.. He's been through multiple moves with me, from one state to another, and from city to city. He was there through it all. Through the heart break and the worry. At one point I couldn't afford for him to live with me, so he stayed with my mom for quite a bit. I moved somewhere safe, and got a job, and he was finally home with me. He was finally back with his mom. I had him back for about six months, and all of those six months I cherished him, I loved him, and I spoiled him rotten with his favorite treats everyday. I cleaned his cage and I watched him run around all the time. Slowly, he stopped being so energetic, and one day I went to feed him a treat but he wouldn't touch it. I knew something was wrong. I rushed him to the closest exotic pet veterinarian I could find and waited in agony to find out what was wrong with my baby. It turns our he had lumps, possibly cancerous, and he couldn't breathe right without oxygen. One of his organs was enflamed. I couldn't let my baby suffer any longer than he needed to, so I let him go. The hardest part was the goodbye, watching him run around in my hands like his old self again made me start to question my decision. But I knew this healthy moment would not last. Three and a half years, almost four, he was by my side; now he's forever in my heart and I'll always have a piece of him with me. He took a piece of my heart with him, as I took a piece of his. Goodbye is never easy, it always hurts, and I still cry. I may never fully heal, but I will always have the love and time this precious little furbaby gave to me. I didn't rescue him, he rescued me. I love you Christian, we'll be together again at the rainbow bridge.